Alejandro Santos Rubino is the Director of Semana, Colombia’s main economic and political news outlet. Throughout his career, Alejandro has led numerous transcendental efforts in Colombia, including Reconciliación Colombia, ProBogotá, Colombia Líder, Votebien.com, Amazonas 2030, VerdadAbierta.com, Fundación Semana, Proyecto Manizales and Proyecto Víctimas. Alejandro’s work has earned him Columbia University’s and Spain’s Rey de España Prize. Alejandro holds an undergraduate degree in Economics from Universidad de los Andes and a specialization in Communication Law Universidad Javeriana. He has also been an Alfred Friendly Press Fellow and a researcher at Georgetown University. 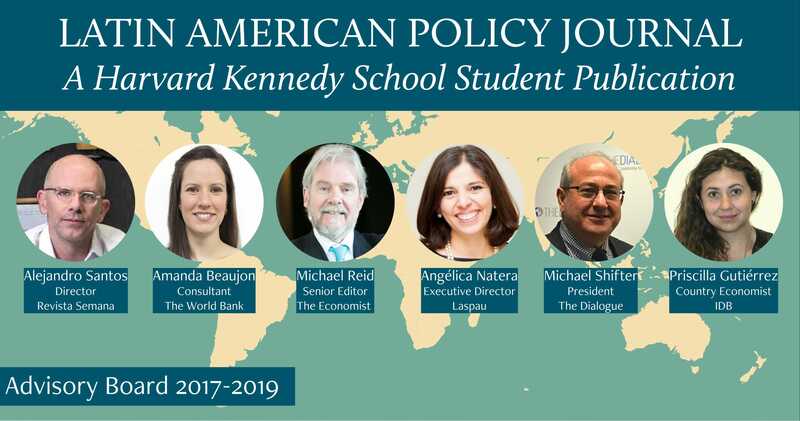 Amanda Beaujon Marin is a consultant at The World Bank. Her particular area of interest is human rights protection and advocacy. Before joining The World Bank, Amanda worked as a Project Assistant for Latin America and the Caribbean at the National Democratic Institute, a nongovernmental organization working to support and strengthen democratic institutions worldwide through citizen participation. She has also worked as a Research Associate at the International Center on Energy and the Environment in Caracas, Venezuela, and also spent summer 2014 developing an advocacy project to address Human Rights violations in Venezuela for the Centre for Applied Nonviolent Action and Strategies. Amanda completed undergraduate studies in Political and Administrative Sciences and International Relations and received her Master’s degree in Public Policy from Harvard Kennedy School. Michael Reid writes the Bello column on Latin America and is the newspaper’s writer-at-large for the region. Michael is a frequent speaker on Latin American affairs, and has provided evidence to the Foreign Relations Committee of the US Senate and to the Foreign Affairs Committee of the British House of Commons. He has also published two books: “Forgotten Continent: The Battle for Latin America’s Soul” (2007) and “Brazil: The Troubled Rise of a Global Power” (2014). He is a frequent guest on television, radio and other media outlets, including CNN, BB World TV, NPR, Globo and El País. Michael completed undergraduate studies in Politics, Philosophy and Economics at Balliol College, Oxford. Angélica Natera is Executive Director of Laspau, a Harvard-affiliated organization advocated to connecting individuals and institutions with opportunities to enhance the quality and impact of higher education in the Americas. For over twenty years, Angélica has worked in the design, development and implementation of education programs in the region. She has also worked extensively along government organizations and NGOs in Spain and the United States. Angélica completed undergraduate studies in Administrative and Management Sciences at Universidad Tecnológica del Centro, in Venezuela. She also received her Master’s in Psychology Universidad Simón Bolivar, and a Graduate Certificate in Management from Harvard University. Michael Shifter is President of the Inter-American Dialogue, a US-based center for policy analysis and communication on issues in the Western Hemisphere, and Latin America and the Caribbean in particular. Previously, Michael served as Vicepresident of Policies of the Dialogue. He is also adjunct professor at Georgetown University’s School of Foreign Service and a member of the Counsil on Foreign Relations. Michael is a regular writer for various media outlets, including Foreign Affairs, The New York Times, Financial Times and The Washington Post. Michael completed undergraduate studies in Oberlin College, Ohio, and received a Master’s degree in Sociology from Harvard University. Priscilla Gutiérrez Juárez is Country Economist at the Inter-American Development Bank in Nicaragua, where she conducts debt analysis and develops macroeconomic forecasts. Previously, Priscilla worked as Country Economist in Guatemala. She has also been an advisor at Mexico´s Ministry of Finance and Public Credit, where she conducted research on price regulations. Additionally, Priscilla has been a research assistant in Monetary Research in the Bank of Mexico. Priscilla completed undergraduate studies in Economics Instituto Tecnológico Autónomo de México and received her Master´s degree from Harvard Kennedy School of Government.